On board the Tornado roller coaster at Adventureland. Amusement parks are a popular summertime tourist destination and two parks in Iowa are considered among the Midwest’s best. Adventureland and Arnold’s Park were recently named among the top 15 amusement parks in the region by Midwest Living magazine. Adventureland, located in Altoona, features over 100 rides, shows and attractions but park spokesperson Molly Vincent says it’s the park’s original roller coaster, The Tornado, that keeps people coming back. “It is still the tallest roller coaster that we have, about 100 feet on that first lift hill, and it’s kind of a right of passage in the state of Iowa,” Vincent says. The Tornado opened in 1977. The featured ride at Arnold’s Park is also a roller coaster, but it’s much older than The Tornado. Arnold’s Park Marketing and Communications Director Di Lorenzen says The Legend Roller Coaster carried its first thrill seekers in 1927. “There are so many people who have memories of the park, but everybody remembers The Legend and riding on that roller coaster,” Lorenzen says. One of the highlights of The Legend is a sign greeting riders at the top of the first hill. It reads “The Point of No Return.” Vincent notes both The Tornado and The Legend are “rickety” rides because they’re both made of wood. “There is just a huge difference between riding a wooden roller coaster and a steel roller coaster,” Vincent says. The Legend is believed to be the 13th oldest wooden coaster in the U.S. Arnold’s Park was saved from the wrecking ball about 12 years ago when donations of $7.5-million kept the site from being turned into condominiums. 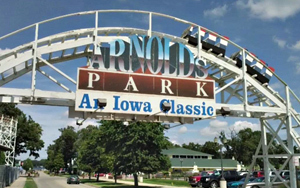 Lorenzen says Arnold’s Park is small, but it’s a unique treasure that Iowans want to hang onto. “We can’t compete with large theme parks, but when people come here, it just has a certain kind of charm,” Lorenzen said. Like Arnold’s Park, and unlike many large theme parks, Adventureland isn’t run by a large corporation. 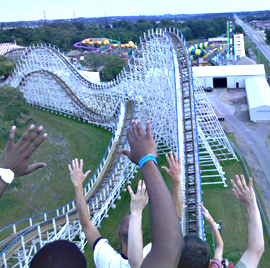 Adventureland is a family owned park, created by Jack and Jan Krantz in 1973. Jack died in 2006. Jan is now the general manager. Molly Vincent is their daughter.